You are walking through a southern Spanish town centre admiring the shops when firecrackers go off around your feet, much to the delight of youngsters intent on scaring the hell out of you. The unforgettable firework smell reaching up into your nostrils brings a sense of nostalgia to your inner child on Bonfire night. Then rising out of the smoke you see these enormous effigies towering in front of you, some of which are as tall as a three storey buildings. Amazing works of art, these satirical compositions tell a story of local, national or international events with a humorous twist. Compelled to admire the artists’ work, your keep your whits about you as the firecrackers continue to test your nerves. Families set alight fireworks in the street, dancing around them in some bizarre ritual of playfulness without any due care for their wellbeing. And then in the distance you hear the sound of a brass band, banging out a tune or two that has you jigging and foot tapping in unconscious merriment. The sight of the entourage looks something like a scene out of The Pied Piper of Hamelin, as trails of young people dressed in national costume parade behind the players, weaving their way through the streets with a partying vibe running through their veins. 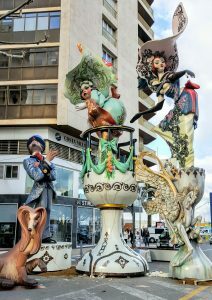 Welcome to the Las Fallas celebrations of the Valencian Community in eastern Spain. One of the biggest festivals for the area that signals merriment, artwork supreme and community spirit. Whilst the city of Valencia is the biggest celebration, other towns in the region also pay homage to the traditions. Our experience comes from Denia, in the southern part of the area. This is one spectacle that must be seen once in your lifetime, although it needs careful navigation and so this is a quick guide to help you survive this mad weekend of festivities and stay safe, sane and enthralled. 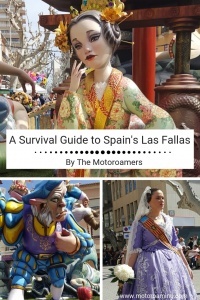 The history of Las Fallas goes back to 18th Century – a tradition that to this day is held in high regard, as district communities prepare, present and honour their unique effigies to the town. 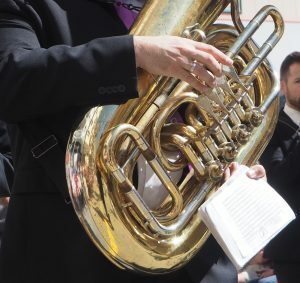 Between the 15-19 March every year, this most incredible event delights the locals and onlookers alike and the daily rituals organise the residents’ diary as they lead up to the pinnacle of the celebrations on San José – 19 March. Initiating on 15th March, at 8.00am there is a call to the day’s festivities called La Despertà – the wake up call – and the party begins. So if you’re staying close to the town, then bare in mind that sleep may be on borrowed time. 15th March also sees the Plantà, when the effigies are installed in each of the districts. These effigies are up to 100ft tall, so it’s not like a carnival float type of experience. The effigies remain in their place for the whole period. You must do the visiting. For Dénia there are 11 districts, so if you want to see each of the Fallas, then you’ll need a map and good walking shoes to see them all as they are in every corner of the town. You can do a walking tour with a guide from Tourist Information on 17 March, which costs €8.00 per person. This is at least two hours and takes you around some of the main districts. Personally, we recommend getting a map and going to visit them yourself. Some of the statues in the outer reaches of the town are not significant so you could probably miss those ones out – keep to the inner sanctum of the town and you’ll get a really good flavour of these masterpieces. La Mascetà – a day-time firecracker performance, which happens at 2.30pm each day in different districts, although we saw them twice in the upper section of Marco de Campo. The display is quite bizarre – we’re not used to seeing fireworks light up a blue, daytime sky. I’ve never been near a war zone although I can imagine that the sound of gunfire and bombs must be like this. The sound and vibration fills your entire chest and creates a slightly uneasy feeling in your heart – although you soon realise it’s a celebration not a war-zone. It is a very strange experience. For a more traditional Firework Display, on 18 March at 2030, there is a huge Mascletada in Plaça Jaume, which is a phenomenal explosion of pyrotechnic brilliance. Highly recommend this one, although get there early enough to get a good position to see it in all its glory. 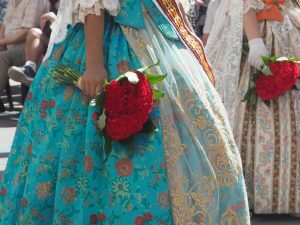 L’Ofrena de flors happens on 19th March at 11.30am along Calle Marco de Campo. This is a procession of flower girls from each district, honouring the Virgin Mary. 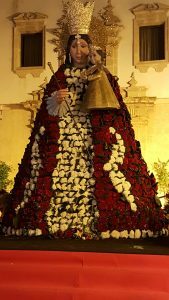 The flowers are gathered outside the Convent on a huge statue of the Virgin, which is then duly decorated. Arrive at 11.00am for a roadside seat which will cost you €3.00 for a couple of hours entertainment. Seeing the girls and boys with their stunning traditional costumes and headdresses carrying bouquets of flowers is a sight to see. Infants, young and old all take part in this celebration of offering of flowers. It’s a long procession, although for 90 minutes it is a lovely sight to see. Choose a place that allows you to pop through to the Convent so you can see the Virgin being decorated. Our suggestion is then – go home and have a restful siesta before the evening’s culmination begins. La Cremà is the finale of the week’s celebrations where each of the effigies are officially burnt to the ground with pomp and ceremony befitting a Queen. 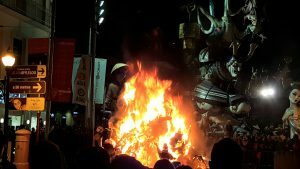 Starting in descending order, from 2100, the burning begins; first the children’s statues and then leading up to the special effigies from midnight through to 3.00am. Fireworks are launched from within the statues signalling the start and what takes months of planning, building and painting is reduced to ashes within 10 mins. Black, toxic smoke fills the streets and air around you. Even the following morning, you can still smell the polystyrene aroma floating around. Flames lick the balconies that overlook the squares that the effigies call home, with Firemen turning their hoses skywards to protect the surrounding buildings. So given the claim to fame of Dénia being the third healthiest place in the world to live, this could be disputed during this weekend. We headed in to town at 2200 to watch the burning of a couple of the little Fallas and then searched out a medium sized effigy burning at 0045. Remember that most schedules are Spanish time, so be flexible. Again get there early to get a spot and take something to cover your mouth as the fumes are really unpleasant for a time. You will get covered in soot so your Sunday best is not required! Go to Tourist Info on 18 March so you can get the schedule of burnings. 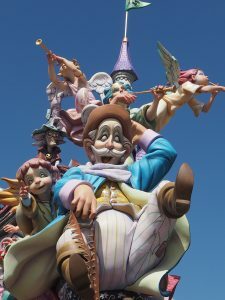 Although do bare in mind that these don’t always go according to plan, so follow the crowds and don’t be tempted to walk to the outer reaches of the town as the statues are not always the strongest in the competition. Our view is, once you’ve seen a couple of Cremàs, then staying for all 11 is not necessary, if your bed is calling. If like us, you have indulged in the festivities throughout the week, this final push is just that. And a couple of burning experiences sufficed for us. 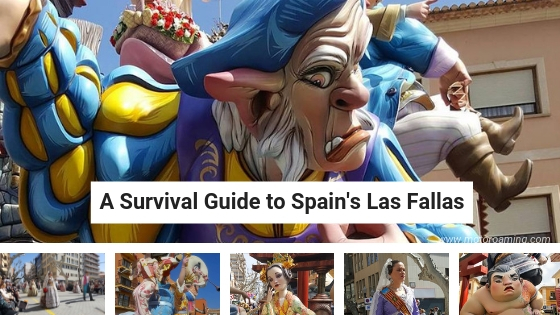 Over all, Las Fallas is one of those experiences that you have to be part of and enter into. We stayed in a campsite about 3kms away from the central hub, www.lospinosdenia.com so managed to retreat from the frenzied activity whilst being close enough to cycle in and feel the vibe. It requires pacing, cameras, videos and good shoes, although certainly worth doing.